If you are from the Agile world, then you must have heard or read the story of The Chickens and The Pigs. Though, I did not like this analogical story when I heard this for the first time in one of my Agile Scrum Training. I was not totally convinced by the analogy given, so never used it and have been advocating against it. 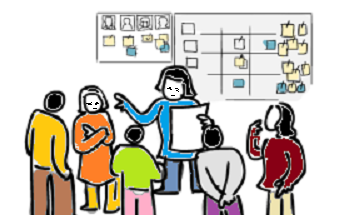 The story is told to explain the active participants during the Scrum meetings, differentiating whether the participants are involved or committed. You can see the detailed description of “The Chickens and The Pigs” in Wikipedia page. In short, it goes as explained below. Pigs are considered to be the active participants who are committed and accountable to the works in hand, they are the actual ‘doers’ of day-today works. Pigs stake are in the game, they are the actual beacon bearer, and their success or failure are determined by the success or failure of the work in hand. Whereas the Chickens are considered to be passive participants, who are not committed to work; who should not get involved in meetings. Generally, the Core Team Members, Product Owner, and Scrum Master, who are the performers to do actual works; are considered to be the Pigs. Whereas management, leaderships, and other stakeholders, who have the interests in the ongoing work; are considered to be the Chickens. Chickens contribute nothing but gains by Pigs performing on a daily basis; as they may have interests on knowing what’s going on or how Pigs are performing regularly. This analogical story is also used to reinforce the fact that, only Pigs can talk in the meetings but Chickens are not allowed to speak so they are supposed to be the mute-spectators. The story has been used heavily (in fact, I will say badly ‘abused’), in describing the scrum roles and meetings. Originally, started as a joke; this concept is entirely irrelevant and shadowed magnification of Scrum roles and responsibilities. I am surprised that many Agilists have accepted and profoundly used without rationalization. When told, it was perceived by many learners in the wrong ways that person in roles and stakeholders; except those from the Scrum Teams, have no place in software development, their contributions or involvement do not have any weigh or valued. This kind of the wrong perception emancipates when somebody coming from traditional waterfall SDLC to learn about the Agile Software Development; especially the Scrum Framework. Many consider that apart from the other ceremonies, during the Daily Scrums; even the SM and PO are The Chickens. This is completely wrong, as the SM and PO also needed to update team; what they have done on the previous day and what are they planning for the day – something like, action taken to remove risks, dependencies or impediments and what they have the plan to address today. Having a commitment to work does not guarantee the success of work. It does mean that other people should keep quite and disengage themselves. Management provides leadership and direction; in order to align with organization’s and program’s long term vision. Even though they don’t actively participate in daily work; but they have indirect stakes to the ongoing work of program / projects for – making high-level strategically investments and funding decision, personnel and team development, drive and assist the program/projects execution and management, ensure governance with appropriate measures, bring transparency through reporting and adherence to necessary regulatory compliance. Customers or clients have also direct stakes in the ongoing work with respect to scope and quality of works, can decide on cost and schedule controls. They would be able to make informed decisions as per the development progress based on inputs from business priority, continuity, and other influencing parameters. They are the one who should be interested in the solution being built, validates the product assumptions and features prioritization in order to decide the minimum marketable features for the viable product. Even though other stakeholders may or may not be involved directly but they can not be dubbed as Chickens having no commitments, having no influence or do not get impacted by success or failure of the work. First the people analogy with animals or birds are totally illogical and irrelevant. Even when people listen to this analogy, by nature many don’t take that at face values because it often appears to be strange and unhealthy. The worst part is that sometimes team members try to make comparison and nasty remarks in ‘pigs & chickens’ language and do something that are against participation of outside stakeholders in various ceremonies. Thus it cultivate to unhealthy agile practices and anti-agile patterns that leads to preventing teams from receiving valuable feedbacks from various stakeholders; due to lack of participation. Direction and supervision from management and leadership are equally important. Agile frameworks like SAFe has given special emphasis to Agile Leadership and Management participation; defining the Lean-Agile Leaders as enablers for the team, who have the ultimate responsibilities for adaption, success and ongoing improvement of lean-agile development lies with the enterprise’s existing managers, leaders, and executives. The project team should make the local decisions, ensure taking appropriate control measures, generate and report metrics via status report or dashboard, inspect and adapt; and do everything that is required to meet their short-term as well as long-term goals. There have been a school thoughts among agile enthusiasts who are totally against management involvement; quoting that management’s practice are always based on command and controls. But these are not the case often. Having been self-managing and self-organizing team does not mean, they don’t require management and leadership supervision and direction. The Scrum.org has already removed this analogy from Scrum Framework. So we agilist should stop making references and scrap it completely. The team and stakeholders should be educated to appreciate and embrace to agility endeavors. Project’s stakeholders should be encouraged to share their opinion and seek information for the overall betterment. Definitely, there is a decline in the use of this story and terminology. Simply, because it conveys wrong messages in Agile community. Hence, the story and concepts must be removed from all the places; be it the online or printed training materials.